Physical characteristics: Hood mockingbirds are dull white on the chest and belly and streaked or spotted gray to brown coloring on the top. The dark wing feathers appear edged off-white. They may also have darker spots on the chest. The Hood mockingbird sports a black streak across its yellow-to-brown eyes, and has a black bill and legs. Geographic range: The Hood mockingbird is found primarily on a small island in the Galápagos known as Hood Island (also known as Espantildeola). Habitat: Hood Island is a low-lying, flat-topped island with primarily rocky terrain and sand and pebble beaches. The available vegetation is primarily scrub. Fresh water is scarce. 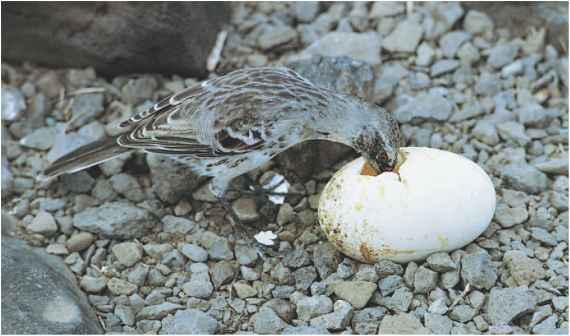 Diet: The Hood mockingbird is an omnivore, which means it eats animals as well as vegetation. 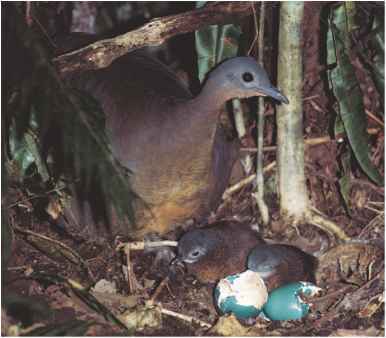 The bird uses its long, curved beak to crack open seabird eggs in order to eat their contents. It will also drink blood from the wounds of other living or dead animals, and scavenge carrion (decaying animal carcasses). Behavior and reproduction: During nonbreeding season, Hood mockingbirds travel in large groups of around forty to forage and defend their territories. In the months of March and April when nesting time occurs, they split off into smaller groups. The species are cooperative breeders, meaning many birds will share feeding duties for the young in a group, not just the parent birds. The typically breeding group is approximately five adult males and two or three adult females. they are said to be unafraid and will readily approach them and scavenge for food and fresh water if accessible. George, Phillip Brandt. "Thrashers, Bulbuls, Starlings." In Reference Atlas to the Birds of North America, edited by Mel Baughman. Washington, DC: National Geographic Press, 2003. Clark, Gary. "A Singer and a Song; Mockingbird's Arrival is Among Area's Signs of Spring." Houston Chronicle (Feb 21, 2003): 3. "BirdLife's Online World Bird Database: The Site for Bird Conservation. Version 2.0." BirdLife International. http://www.birdlife.org (accessed on May 25, 2004). "Gray Catbird." All About Birds. Cornell Lab of Ornithology. http://birds. cornell.edu/programs/AllAboutBirds/BirdGuide/Gray_Catbird_dtl.html (accessed on May 28, 2004).